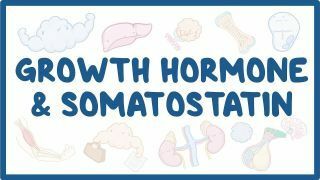 Osmosis: Growth hormone and somatostatin. (2019, April 20). Retrieved from (https://www.osmosis.org/learn/Growth_hormone_and_somatostatin). The delta cells of the pancreas secrete somatostatin, which functions to inhibit insulin and glucagon release. Somatostatin is also called growth hormone-inhibiting hormone, and inhibits hormones released from the anterior pituitary gland and gastrointestinal system as well as the pancreas. Growth hormone is the most important hormone for normal human growth. It is also called somatotropin because it is synthesized in somatotrophs in the anterior pituitary gland. Growth hormone synthesis is stimulated by the release of growth hormone releasing hormone, and is inhibited by growth hormone inhibiting hormone, which is also called somatostatin. Growth hormone carries out its direct actions by binding to receptors in some tissues, such as the liver, adipose tissue, and skeletal muscle. A 45-year-old man comes to the clinic because of a recent weight loss of 4.5-kg (9.9-lb) and fatty stools. He has a history of diabetes mellitus and gallstones. Laboratory studies show decreased concentrations of pepsinogen, amylase, lipase, insulin, and glucagon. A CT scan shows a mass in the pancreas, Based on this patient's symptoms, which of the following substances might be secreted by this pancreatic tumor?